Paradigm developed conceptual designs for three large-scale regional stormwater capture projects for the city of Carson. The projects are the signature retrofits for the City’s future capital improvement programs, and key to complying with NPDES/TMDL requirements. An intensive GIS analysis was performed to identify optimal sites for capturing stormwater. Each project received a concept design fact sheet that can be used in discussions to pursue funding, discuss project alternatives, and support City decision-making. Drainage area analysis and hydrologic calculations were performed to inform project sizing. Footprint configurations, diversion alternatives, and project phasing scenarios were presented to the City to assist with project decisions. One of the projects, Carriage Crest Park, has already received funding from Caltrans and is being designed and constructed (with no match!). Paradigm completed two critical tasks to support design of Carriage Crest and further evaluate feasibility. First, Paradigm performed a field investigation to verify and refine the 1400-acre capture area. 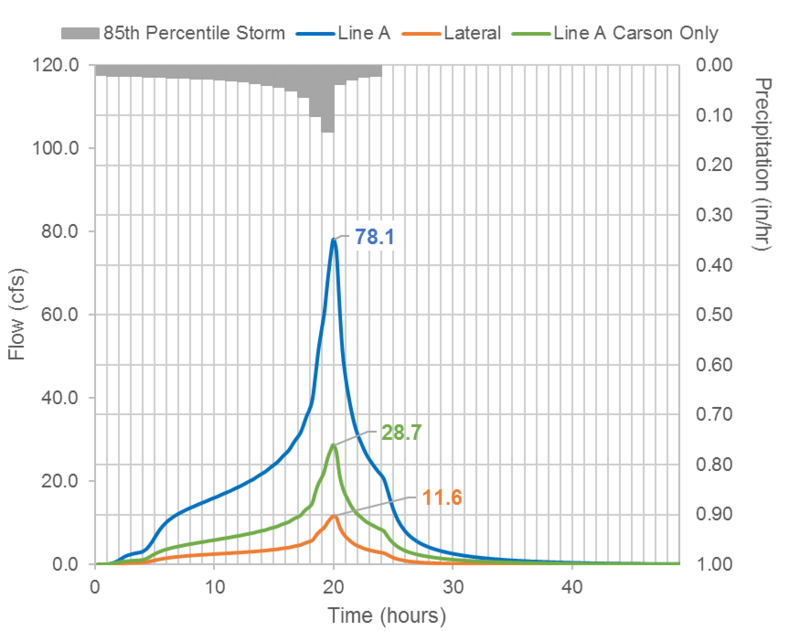 Second, hydraulic modeling was performed with the Stormwater Management Model 5 (SWMM) to provide the City with more reliable volume and diversion rate calculations to inform project sizing (see figure below). Paradigm continues to support Carson with MS4 tracking and reporting and other TMDL implementation tasks.